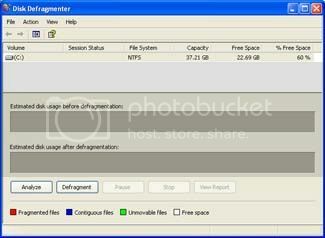 1.Click Start, point to All Programs, point to Accessories, point to System Tools, and then click Disk Defragmenter. 2.In the Disk Defragmenter dialog box, click the drives that you want to defragment, and then click the Analyze button. After the disk is analyzed, a dialog box appears, letting you know whether you should defragment the analyzed drives.Tip: You should analyze a volume before defragmenting it to get an estimate of how long the defragmentation process will take.3.To defragment the selected drive or drives, click the Defragment button. Note: In Windows Vista, there is no graphical user interface to demonstrate the progress—but your hard drive is still being defragmented.4.To display detailed information about the defragmented disk or partition, click View Report.5/To close the View Report dialog box, click Close.6.To close the Disk Defragmenter utility, click the Close button on the title bar of the window.